Manuel Antonio Beach is one of the most picturesque beaches I have seen during my travels in Central America. Located not too far from the small town of Quepos on the Pacific coast, the Manuel Antonio beach is actually part of the Manuel Antonio National Park, one of the most visited parks in the country. What characterizes this area amidst Costa Rica's bountiful natural landmarks is the beautiful grey-sand beaches framed by the lush and green tropical rain forest. Standing on the coast of the beach facing the Pacific, I couldn't help but be reminded of a scene out of Jurassic Park. Plus, the beach has an added attraction of being a hotspot for many exotic tropical animals. On any given day, you can spot white-faced capuchin monkeys lounging around in one of the many trees surrounding the beach; hear howler monkeys marking their territory with their resounding voice; and spot a or a Tucan or two flying through the jungle. 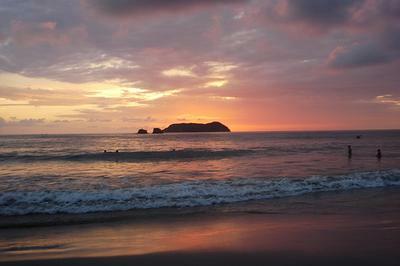 There are a few different beaches that make up the larger Manuel Antonio beach. The one surrounded by a cove offers the best protection in terms of water movement and provides the best picturesque scenery. Manuel Antonio beach is a must for anyone visiting Costa Rica, and comes highly recommended not only for the beautiful beaches, but also for the plethora of rich animal life not seen anywhere else. Nori's Reply: Wow! Thank you for sharing this special beach, Jenny. Manuel Antonio looks like quite the exotic paradise, between the snorkeling, tropical rainforest surrounding the beach, and its perfect rolling waves. Its shores look unspoiled. We've never visited Costa Rica, but have put it on our list after visiting, and enjoying, Panama. Hope to visit there soon!